Well if you're shipping internationally then obviously the cost will be through the roof.. However, it only works out as a few £ extra from where I buy from. Also, I'm buying from well-trusted people in the hobby, I know that they take good care of the fish, I know that they breed some of them themselves, I know that they would choose to send quality fish.. I'll always be paranoid about the fish's health on delivery but in reality they are well packaged and quickly delivered. Most online fish suppliers have a DOA procedure and you will be refunded or resupplied with what you ordered, so there really is no reason to worry. In all honesty, I'm never surprised if an LFS bought fish develops an issue in the first day or two. I keep African Cichlids which aren't exactly the cheapest fish in existence, it's nice to know that the people I'm buying off are aware of that as well. The DOA policy is usually they will give you an other fish, but you must pay shipping, $50 for that $7 fish that died. As for the shipping to the store, that's a good point, but sometimes like my local guy, he gets his angels from a local breeder, same with a lot of his ciclids. But also, I'd rather let the store pay the shipping and get to go down and pick the healthiest of the bunch or the color/gender I need. thats what i would like, something that is rare and unique.. an aquarium that will catch peoples eyes and be in awe when they see the fish and how pretty some are. You would need a little bit bigger tank for rainbowfish. 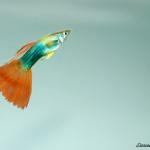 Some guppies are very pretty, or cichlids but they need there own tank. I would highly recommend a Liquid test kit like the APi master test kit and then also pick up a phosphate test. Have you had good luck with live aquaria? We used Arizona aquatic gardens and was very unhappy with the fish and the customer service. After that I was too worried to try again. i am getting very close to throwing the towel in on all 3 tanks i have. i am so tired of everything going wrong and nothing going right. i have invested alllot of money into this, expecting it to be fairly reasonable. Dont get me wrong, i love the 1 aquaruim i have. i have an angel fish and am trying to get rid of the others so i can have a beautiful tank to look at and relax watching it. just as i thought things were going well and started w/ plants B A N G i get a huge ammonia spike.. who knows how, i tested it 2 days earlier and it was fine, had a lfs test it and he couldnt believe i had fish still living. was bad enough he said he wouldnt even sell me a fish because it would die... what should have been a fun and enjoyable hobby for myself and something to include my little girl in has become a nightmare... now i have 2 tanks. 1 with the fish id like to keep (yup thats the ammonia one), then another 29 gal w/ fish that i want to sell and a 20 gal long w/ goldfish and an african albino clawed frog which i was told when i bought it that it was a dwarf.. i wanted a dwarf NOT one that grows up big.... GRRRRR i often wonder if im the only person who has had so many issues?? I was livid cuz they are extremely hard to catch. I was at LFS the other day and they had them listed as community peaceful AE. I advised the store worker and the man buying them (a guppy tank). That they are CAE and aggressive. Well both were NOT happy with my 2cents worth. He bought 5. I left it at this, when your guppies start to die this is why. I also told him my story. The 1 was killing at least 1 guppy a day, then started to get at their eyes. I tried to help. Here's a question about Oto's, flying fox and SAE. They all look the same to me, how can I tell for sure what I'm getting. So many stores have them mislabeled or not labeled where it's clear what's what. Otis are much smaller and flatter. The differences with SAEs vs Flying Foxs are easy. The black stripe runs all the way through the tail and has a zigzag pattern for the SAEs. The FFs have a straight black line, no pattern, and the line ends at the tail fin. As for ordering on line and shipping, aquabid has some very good sellers with very reasonable pricing. You can find free shipping deals all the time. If you take the time to read the reviews about the sellers you'll know who to buy from. You also can either buy or bid like eBay. I get most of my stock from aquabid sellers. I've also never gotten a diseased fish from there. Thanks so much for the tips. I'll check into that site. I'm restocking my 29 gal and have 2 angels want something to go well with those. Is this a FF or an Oto?